MC Glass Art Inc. now offers glass awards designed for employee recognition, corporate recognition and other prestigious awards ceremonies. Each piece is one-of-a-kind, handcrafted entirely by hand, and signed individually by master of glass art Hung Nguyen. 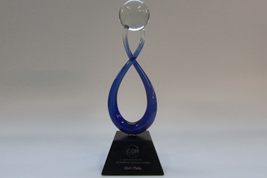 Custom awards are a great way to reinforce and uniquely communicate your organization’s brand and event positioning. The types of custom awards MC Glass Art can create cannot be duplicated, since each one is sculpted by hand and not mass produced. Our custom awards are organic and unique in nature, since each one is handcrafted, not machine-automated. Each one is a true work of art that imbues a true “personality”, essence, and feeling in the award design that is impossible to create by machine. In addition, design and creativity ideas are limitless. We can stay within the parameters of your organization’s branding guidelines, yet create custom awards of any size, shape or height.